Your guide to a romantic island getaway. Your guide to Historic Downtown Fernandina Beach, once a stomping ground for pirates, Gilded Age millionaires, bootleggers, shrimpers, and other colorful characters. Savor over 90 restaurants, a growing number of farm-to-table experiences, and the presence of visiting and resident star chefs. 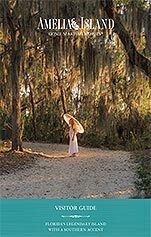 Stay a while at one of Amelia Island's resorts, inns, condos, hotels, or vacation rentals and discover the Southern hospitality of this enchanting island.